Signal is not worth the money. Lies to his customers saying that he always uses a stop loss, only have 10% of drawdown. He likes to hang on to trades for weeks/months at a time and is not worth it. 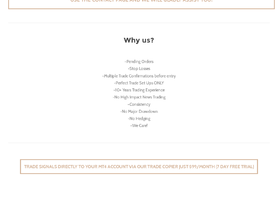 Trades go very negative in your account (over 1000+ pips). Stay away!